If you’re having trouble starting your vehicle or you’ve noticed your accessories are dimly lit, it could be an indication of an underperforming alternator. When you need alternator repairs in San Antonio, TX, Cartech Automotive & Transmission Repair is here to help. 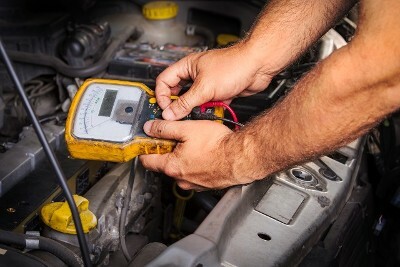 Bring your vehicle into our specialists to get to the bottom of your electrical troubles. When you bring your vehicle to our shop, we’ll provide you with a comprehensive assessment. During our assessment, we’ll test how your alternator, battery, and starter perform at idle, during high RPMs, and under high-voltage loads. After gathering this information, we’ll determine whether you need a repair or an alternator replacement and have your vehicle restored as quickly as possible. Electrical systems are responsible for starting your engine, running your vehicle’s many components including your headlights, radio, windshield wipers, and more. Specifically, your vehicle’s alternator is the generator that works in tandem with your battery to create and distribute the charge that is sent through your vehicle’s various electrical components. Without a properly working alternator, your vehicle can’t draw the power it needs to turn on and stay on. Call on our in-house technicians to handle your alternator repairs and put an end to your electrical troubles. With more than 30 years of experience to our name, you can count on our skilled technicians to accurately diagnose your electrical issues and fix them quickly. Whether your check engine light is on, you’ve noticed a decline in performance, or your vehicle regularly fails to start, we’ve got a solution that will address your concerns. Best of all, you can always expect quality workmanship when you bring your vehicle in for alternator services, engine work, or any other repairs. We offer guaranteed work, meaning you can have the peace of mind you deserve. Bring your vehicle into our trained specialists today and we’ll provide you with a solution that brings your electrical problems to a halt and puts you back on the road. Contact our auto shop to request an appointment for electrical services. We proudly serve drivers in San Antonio, Helotes, Leon Valley, Pipe Creek, and Bandera, Texas, and the surrounding communities.